I woke up at 10 am to what seemed to be the soft pitter patter of rain against the glass windows of my apartment. As I opened my eyes and took a peek out the window, all I could see was a sea of grey skies casting a dark shadow over the city. I got up still feeling quite groggy thinking to myself I shouldn’t have slept that late last night or this dawn technically. I went to make myself a cup of coffee and as I brought the caffeine-filled mug to my lips I could feel the loud roar of my stomach. With the weather you could have mistaken it for thunder. I need to eat I said to myself. I scavenged around my apartment looking for something to eat or at least something I can cook with but all I could find was a small pack of crackers. I walked towards the window with my crackers on one hand and my coffee mug on the other and I stared at the dark clouds looming overhead. I was unware that I had almost finished eating the last piece that I took a big bite only to have part of my finger in my mouth and a little piece of the cracker. Still I felt my stomach rumble. So I thought maybe I could order food but I still had no idea what I wanted. After putting a little thought into it, I decided I wanted to order some Thai Food Delivery. I figured the delicious aroma and spicy flavors of the food would be great for this kind of weather. So then I called Aloy Thai Cuisine and placed my order of Tom Yum Gong, Pad Thai, and Khao Pad. I was getting quite hungry but I knew that I had to wait as the restaurant isn’t near my apartment. While waiting for the food to arrive, I found myself entering a flashback to when my first girlfriend introduced me to Thai food. 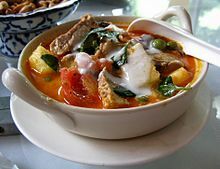 At that time, I wasn’t a fan of spicy food but slowly I loved it and Tom Yum became my favorite which is why every time I order Thai food whether in a restaurant or for delivery, I always make sure to get Tom Yum. Despite my hunger I actually started to doze off but my nap was cut short by the ring of the doorbell. I quickly rushed to the door and to my joy it was the food I was expecting. I paid for the delivery and made sure to give a generous tip, after all the weather isn’t that favorable today. I set the food on the dining table and quickly got into it. The food that I have ordered from Aloy Thai Cuisine could have fed two but I was able to consume all of it in less than thirty minutes. As I took sips from the Tom Yum, I could really feel it warming up me and my soul. Truly Thai Food is something to be treasured. Previous Previous post: Professional Dog Trainers Know How Dogs Think.